We're on our way home; we've turned South! I'm writing from a bunk bed in a KOA Kabin (!) at the KOA a few miles east of Couer D'Alene, Idaho. Randy was so tired that he did some pretty funny falling asleep "skits" while trying to not fall asleep. He woke himself up with a couple of quick "snorts" while lying on his back on the bed in his clothes. Then he sat up with his arms folded to say his prayers while I was reading in the D&C. I heard his breathing slow down, then watched his head droop until his chin must have been on his chest. I tried clearing my throat and stuff, to bring him "back to life", but it didn't work. Finally, he started tipping over sideways, with arms still folded, until he had fallen to about a 45° angle. That's when he woke up - on the way down - and somehow kept himself from falling headfirst onto the floor! What could I do but say rather loudly, "Amen!" He said, "Yeah...something like that...." and finished getting ready for bed. Randy had good reason to be tired. We left Osoyoos, B.C. 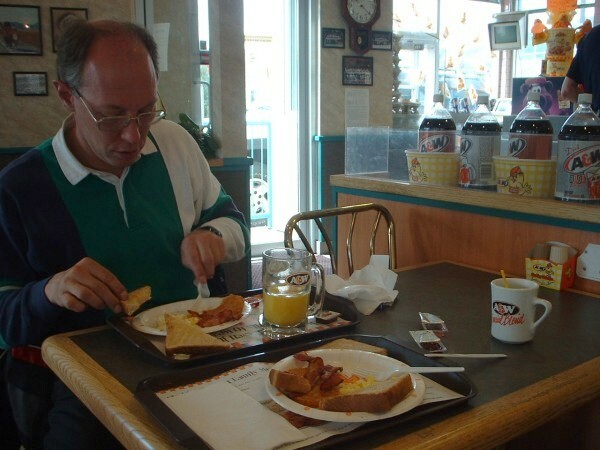 this morning, after an A&W breakfast, at about 11:00. Oh, and after stopping at the Mailbox, Etc. place in town so Randy could mail a postcard or two. He had spoken with the lady inside yesterday while I was using her phone book to make several phone calls. She was glad to know that we had recovered my lost credit card. We stopped on the hill climbing east out of Osoyoos and took some pictures of the town. Then we continued on until it started sprinkling and the clouds ahead looked really bad. We pulled over and donned our rain gear for the first time in the whole trip so far. I used the self-timer on my digital camera to get a picture of both of us in our gear. This was just before reaching the town that Randy said was called Midway. We got rained on - intermittently - for the next 3 or 4 hours. 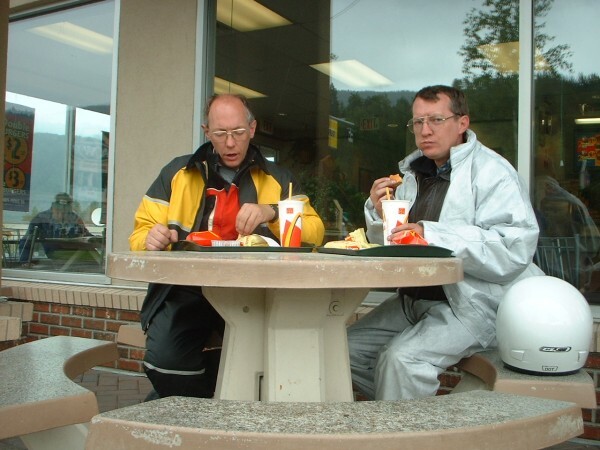 We ate at a McDonald's in Castlegar after passing through some high, cold terrain. Along one stretch some workers were (I think) forcing some of the roadside rocks to fall, before they fell by themselves and caused problems. I also remember something about a worker suspended on a wire below and beside a pretty high bridge that crossed a ravine. I forgot to mention passing through Grand Forks, which seemed like a great little town. And Christina Lake was very pretty. In time we came to Nelson - after a picturesque riverside/lakeside ride. At Nelson we crossed a bridge while we rode towards Balfour. Here we began our most unique B.C experience. We took "the longest free ferry in North America" over to ... Kootenay Bay? The ferry was fun to wander around on. One of the "regulars" even offered to take pictures of the 2 of us, with our cameras. Then I took one of him and Randy. At the end of the trip (30 minutes or more!) we rode off with the logging trucks and passengers and then stayed to take more pictures of the ferry. We continued to ride B.C. Highway 3A down to Creston. 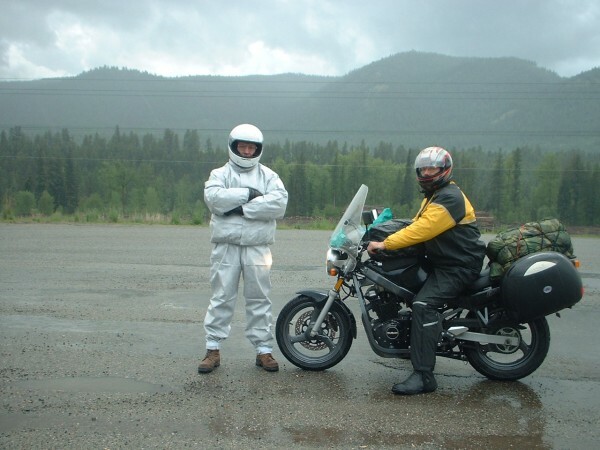 We encountered very few cars and motorcycles in the first 30 miles or so, and some spectacular Kootenay Lake scenery to go along with the curvy road. From Creston we caught B.C. 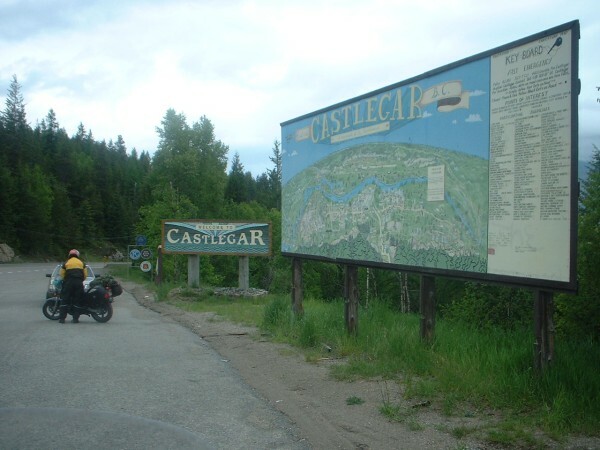 highway 21 to the US/Canada border. We decided to try for this KOA tonight. We made it here at 9:30, just after the office had shut down their computer. They were nice enough to turn it back on and register us. Randy really wanted a Kabin instead of a wet tent site and a wet tent to deal with in the morning. Good choice! Dinner was a can of tamales and a can of fruit cocktail, along with sundry snacks.